Microsoft is continuing to purge Groove Music from its system, and today announced that it's killing off the service's apps on Android and iOS. The apps are no longer available to download, though if you already have one installed you'll be able to keep using it to play tunes stored on OneDrive until December 1, when the apps disappear to the great SD card in the sky. Your music will remain in your OneDrive account, but you'll need a different player to enjoy them. In a display of camaraderie with its fellow tech giants, Microsoft recommends using Google Play Music or iTunes Match as alternatives. 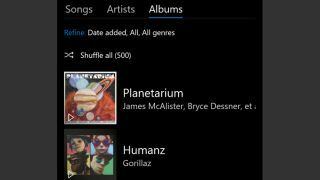 It also suggests switching to the Groove Music app for PC, Xbox and Windows Phone, although the latter isn't a viable long-term solution due to the protracted demise of the mobile OS. Groove Music's fate was sealed in December 2017, when Microsoft opted to bow out of the streaming game and get cosy with Spotify instead. Groove Music lost the ability to stream, purchase and download music, but the mobile and desktop apps were still available and functioned as simple media players. Groove Music was also built into Cortana, where it provided a Shazam-style music identifying service. It was a very handy tool, but after Microsoft pulled the plug, the virtual assistant began producing nonsensical placeholder error messages before losing its song ID chops completely. Despite Microsoft's optimistic suggestion that you try one of Groove Music's other incarnations, we suspect these will probably be terminated soon too in favor of an even more harmonious duet with Spotify – possibly before the end of the year. What are the best free music apps for iOS and Android?